We are moving right ALONG in this ol' Hamilton's life, friends. 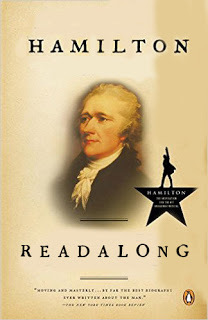 In this week's chapters (10-13), Chernow goes over Hamilton's time building up a successful law firm (albeit one with an awful lot of Tory traffic for the patriots' tastes); reflects a bit on Hamilton's past and how it might impact his future; dives into the Constitutional Convention and all its drama llamas; and gives us a full-on rundown of the Federalist Papers that puts Clifs Notes to shame. That last was about as interesting as reading Clifs Notes, to boot, which is not at all interesting. As this was the speech in which he argued for a kind of modified monarchy system for the American government, yes, "completely daft" seems fairly apt. Stop apologizing for him, Chernow. Those kids were as much his doing as his wife's, and one's wife being a mother does not make a good excuse for one becoming a philanderer. I know, it's a different time, etc. etc., but for a man who could be so forward-thinking about manumission and slavery, and hold the individual women in his life to such high standing (or so it seems), it is still astounding to me that he could be so backwards in this view. What I loved most about this section was seeing the many, many opportunities history provided for America to take a completely different path than the one we're on. It's easy to take the Constitution for granted, to forget that it actually was not in place in the earliest years of our nation, to assume it was a done deal that freedom of the press and freedom of religion and a three-branch government and states rights and whatnot would fall into place. In actuality, the Constitution was an imperfect (though perhaps as perfect as it could have been, given the context in which it was written) political document borne of necessity, against the mandate of Congress, and passed only by a hair.